Bookcases in two sizes with sides in transparent extralight glass and shelves in black paste glass 8 mm. thick, tempered and thermo welded. 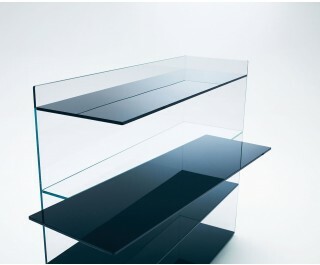 A shelf, fixed at the edge of the shaped extralight glass and inserted only partially inside it, protrudes further than the other shelves with a slipping effect.